In the '80s TAMA's Superstars and Imperialstars reigned supreme - the perfect drums for the times. 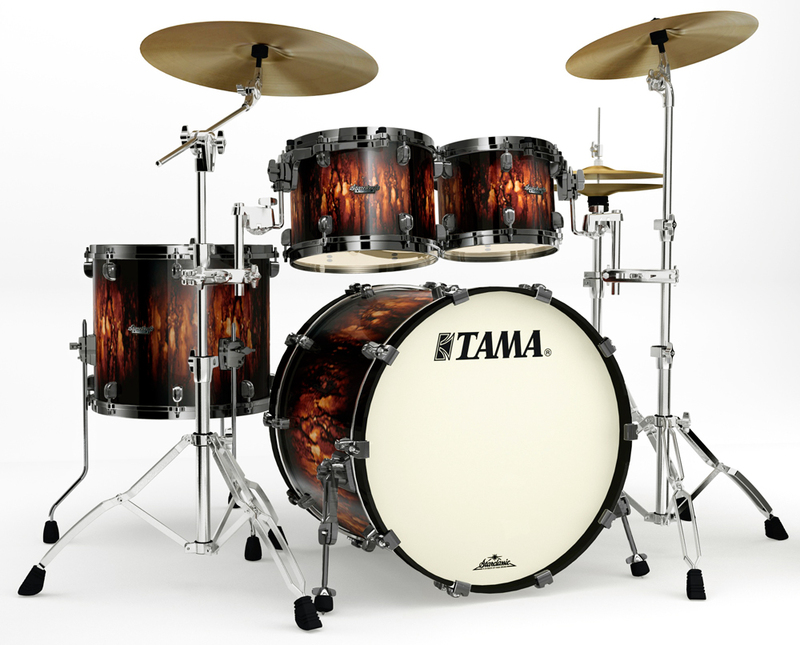 But TAMA's builders and designers wanted something that transcended trends, something timeless - drums that understood a player's passion and allowed the expression of every genre, style, mood, and technique. They created Starclassic Maple drums...and ignited the thin-shell revolution. To achieve the sound and response you are looking for, Starclassic Maple offer a choice of six different depths ranging from the shallow Hyper-Drive to the cavernous X-tra Deep. TAMA's new 20"x22" Ultra Deep bass drum size is now available. This size provides thunderous low end combined with maximum resonance. *Hyper-Drive sizes: 6"x8", 6.5"x10", 7"x12", 7.5"x13"
Starclassic Maple's claw hooks feature rubber spacers that help protect wood hoops from damage. The hooks and hoops work as one unit and won't separate or rattle, even on loose tunings. Starclassic's Air PocketTM rubber feet feature a special air chamber, that eliminates the transfer of vibrations to the floor (which chokes sustain and sound) and absorbs shock for better playing. The Hold TightTM washer is a totally unique invention: a non-loosening washer! Its cup-shaped stainless steel washer contains a rubber ring so the tension rod pushes both the cup washer and the rubber ring. Normally, vibrations will eventually loosen the tension rod. But the softness of Hold Tight's rubber ring keeps it in contact with both the tension rod and the hoop at all times and maintains friction between them so that tension is always preserved.